Fossils are the remains of organisms or their activities. Fossilized shells or bones are the direct remains of mineralized tissues of living organisms. Soft tissues, including chemical traces of anatomical structures or mineralized remains of the tissues themselves, can reveal detailed aspects of anatomy and behavior. Trace fossils are the result of activities of ancient organisms and include trackways and trail, burrows, nests or brood chambers, and tools. Human artefacts are a kind of trace fossil. A temporal sequence of fossils of the same morphological species is considered evidence of ancestors and descendants of a lineage. This kind of sequence provides information about changes in morphology and abundance of a series of populations in a particular region over short intervals of geologic time. Individual fossil assemblages that contain the remains from many different species provide information about the ecological community that occurred in a particular place and time long ago. Fossils occur in sedimentary rocks that formed in ancient ecosystems. Together the geological features of the rocks and the biological features of the fossils provide information about ancient ecosystems (biota + physical environment) and often about the climate, topography, and general environment of the ecosystem. Here we highlight eight features in the fossil record that represent significant transformations in the history of life. Earliest organisms. We reviewed this topic earlier. The emergence of life on earth was the beginning of a history that leads to the present day, not only in terms of our existence but also in terms of a series of mutual interactions between living and physical systems on earth. Organisms interact with the atmosphere, the water cycle, the oceans, soils, weathering, erosion, and deposition of sedimentary rocks. Photosynthesis and the rise of oxygen in the atmosphere. The earliest photosynthetic prokaryotes likely practiced anoxygenic photosynthesis By 2.5 Ga, oxygenic photosynthesis had generated enough free oxygen to react with surface rocks and to accumulate in the atmosphere. From that time forward, the earth’s atmosphere had varying amounts of oxygen. Its presence affects the chemistry of surface rocks, the ocean, and organisms themselves. The rock record provides the evidence of oxygen in the early atmosphere, more than the fossil record per se. Origin of eukaryotes. Eukaryotes represent a change in size and structure of cells, from which eventually multicellular animals, plants and fungi arose. Judging from the widespread symbioses between prokaryotes and eukaryotes today, there has been substantial interaction between eukaryotes and prokaryotes throughout their co-occurrence on Earth. Multicellular eukaryotes are known from the fossil record as early as 2 Ga but are not widespread as fossils until about 600 Ma, with the Ediacaran biota. Cambrian explosion. The oldest fossil skeletons (mineralized tissues of silica, lime, or phosphate) occur in the Cambrian, which began a mere 540 Ma. By the middle of the Cambrian Period, fossil shells and skeletons document a profusion of body plans of macroscopic animals, many with great mobility as swimmer, crawlers, or burrowers. The origins of most modern phyla (e.g., arthropods (insects, crustaceans, and relatives), chordates (vertebrates and relatives), cnidarians (corals, anemones, and relatives)) were present. Invasion of the land. Prokaryotic ecosystems occurred on land as mats and crusts of bacteria in the Precambrian. Multicellular plants and animals invaded the land by the Silurian Period. Success on land required structural tissues for support and a watertight skin to resist desiccation. Lignin, the main component of wood, provided these functions for woody plants. Chitin provided these functions for a number of invertebrate groups, including insects. Phosphatic skeletons provided support for vertebrates on land and the amniotic egg permitted life cycles to become fully terrestrial. Vertebrate diversity. The most numerous vertebrates today are fishes and their fossil record starts in the Cambrian Period. Terrestrial vertebrates first appeared in the Devonian as large and small amphibians. The amniotes, those vertebrates that have the amniotic egg, are first known from fossils in the Mississippian, about 340 Ma. We humans are amniotes, from the synapsid branch of amniotes. 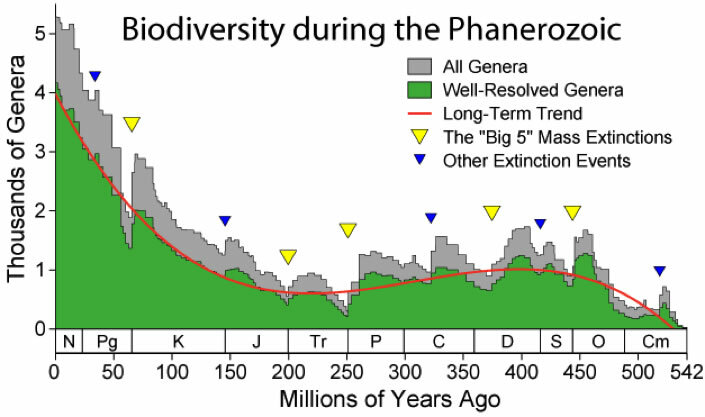 Animal diversity over the last 540 million years (Phanerozoic). Fig. 2 illustrates the general pattern of global marine animal diversity in terms of genera (closely related species are grouped into genera). This information is compiled from hundreds of sequences of sedimentary rocks and the fossils contained within them. Diversity increased rapidly from low values in the early Cambrian and then remained fairly stable until the end of the Permian, about 250 Ma. The huge mass extinction at the end of the Permian reduced global diversity to Cambrian levels. Since about 200 Ma, the marine diversity has increased substantially to the present high levels. The five mass extinctions represent episodes when large portions of the biodiversity became extinct. 8. Human evolution. Our own evolutionary history goes back all the way to the origin of life on Earth. More specifically, the fossil record of humans and their close relatives extends back about 7 million years. The earliest fossils of the broader human lineage (hominins) are 7 Ma from Chad. The earliest fossils of the genus Homo are about 2 Ma, from East Africa (Ethiopia and Kenya). The earliest fossils of Homo sapiens also occur in East Africa. Fossil and genetic evidence suggests that our species arose about 200,000 years ago. This brief time interval at the boundary in time between the Paleocene and Eocene epochs (fig. 3) witnessed changes to the atmosphere and global ecosystems that offer insights into modern global warming and its ecological consequences. 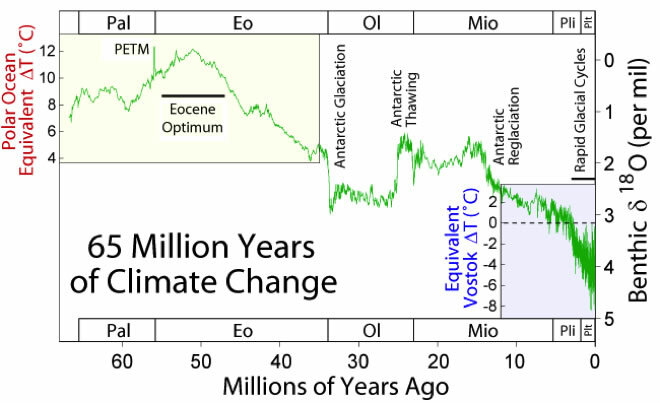 CO2 and temperature increased substantially over a period of about 20,000 years. This fossil record of plant-insect interactions during the PETM allows us to evaluate the ecological responses of global warming at time scales similar to those of the current century. Modern experiments show that plants grow faster under elevated carbon dioxide levels. The C:N ratio increases in such plants because the rate of nitrogen incorporation does not increase as fast as the rate of carbon uptake. Hence, the plants are less nutritious to insect herbivores. Consequently, herbivorous insects eat more plant material under elevated CO2 in modern experiments. In a study of leaf fossils from the PETM by Currano and colleagues (2008), insect damage was significantly higher than during older or younger time intervals from a richly fossiliferous sequence in Wyoming. There was more damage, more kinds of damage, and a higher frequency of specialized damage types in leaf fossils from the PETM. These results suggest that modern forests will experience increased insect herbivory as CO2 levels rise in the atmosphere. Currano, Ellen, and others. 2008. Sharply increased insect herbivory during the Paleocene-Eocene Thermal Maximum. Proceedings of the U.S. National Academy of Sciences vol. 105: 1960-1964. Gingerich, Philip. 2006. 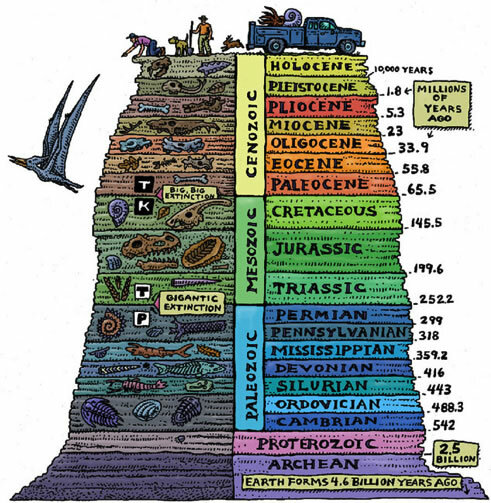 Environment and evolution through the Paleocene-Eocene thermal maximum. Trends in Ecology and Evolution vol 21: 246-243.